Pest Control Spring, TX: Pest Problems? Call a Spring Exterminator! No one enjoys discovering pests in their home. Unfortunately, this is a common occurrence for homeowners, especially those living in southeast Texas. 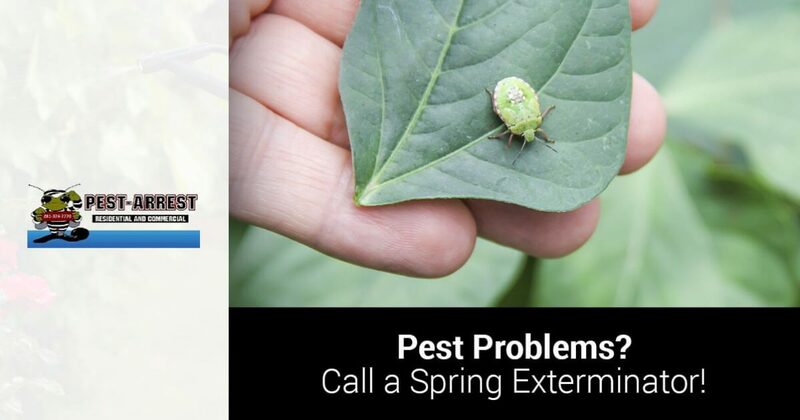 Thankfully, you can count on the experienced Spring exterminators at Pest Arrest to help you eliminate pests in your home. We offer a variety of residential and commercial treatment options that are suitable for virtually any need and any budget, and we would love to help you win the war against unwanted pests. Give us a call at 281-715-0346 today to request your free inspection and estimate. 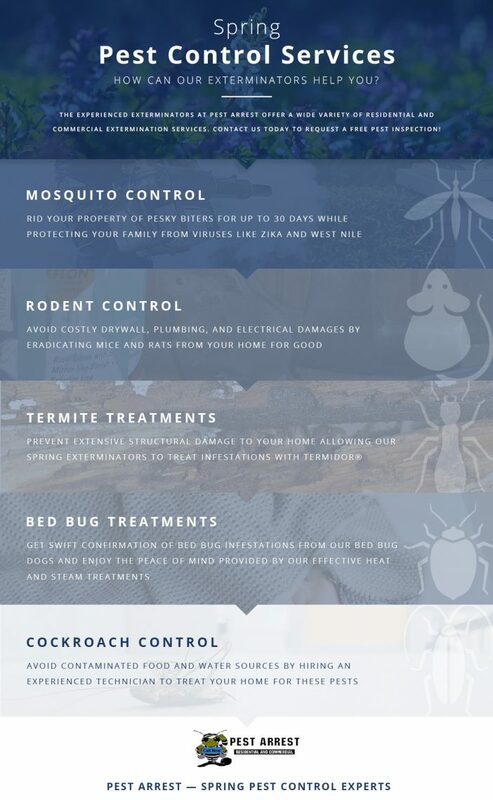 In the meantime, check out a few of the affordable pest control services we offer below. These pesky insects can be more than just a nuisance. Mosquitoes have been known for spreading a number of viruses, including Zika and West Nile. Our Spring exterminators provide mosquito control treatments that are designed to eliminate the presence of biters for up to 30 days, and we have several different packages for property owners. Whether you choose a complete seasonal package or a one-time treatment for a special event, Pest Arrest has you covered. Rodents are one of the most feared pests amongst homeowners. Not only can they cause significant damage to your home’s drywall, insulation, plumbing, and electrical components, they are also known for spreading more than 35 diseases. With rodent control from our Spring pest control company, you won’t have to worry about fighting a frustrating, untimely infestation. Did you know that termites cause more than $5 billion dollars in property damage each year? It is true, and thanks to the warm, humid climate we have, termite infestations tend to be a common problem for property owners. Our team of technicians doesn’t wait around for baiting tactics to work. We use Termidor®, an incredibly efficient and effective termite defense product, to protect your home from destructive infestations. The thought of bed bugs hiding out in mattresses, furniture, and other places around a home is enough to make most people squirmy. These pests are incredibly resistant to pesticides, and many times, it takes thermal heat or steam to kill them. Our specially trained bed bug dogs will sniff out any live bugs and our experienced technicians will determine the best course of action to rid your home of these pesky insects. About 30 of the more than 4,600 known species of cockroaches are associated with human habitats, and here in Texas, homeowners commonly find themselves fighting off four in particular. The American cockroach, smoky brown cockroach, German cockroach, and Oriental cockroach can all contaminate food and exacerbate asthma and allergies. Thankfully, you can rely on the cockroach control services that our Spring exterminators provide to keep your house free and clear of these pests. Have you discovered rodents, bed bugs, or cockroaches in your home? Would you like to safeguard your home from termite damage and protect your family from pesky mosquitoes? If so, Pest Arrest is here to help. We are your Top Rated Local® Spring pest control company, and we are happy to provide you with industry-leading extermination services for your home or business. Contact us today to get started — we look forward to hearing from you!